TT is something I know basically nothing about really. 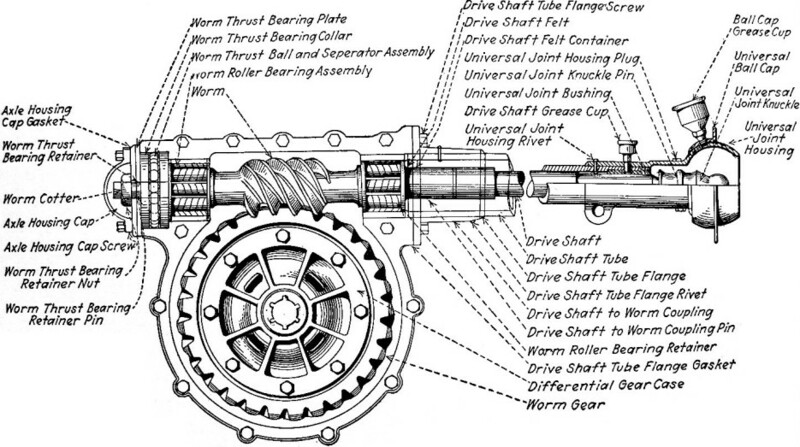 But I thought I should get around to drawing the worm drive axle, so I started in on a cross section. As far as I can tell, the drive shaft, torque tube and maybe even the "U" joint were the same as on the cars...if there is a difference it is probably the length. 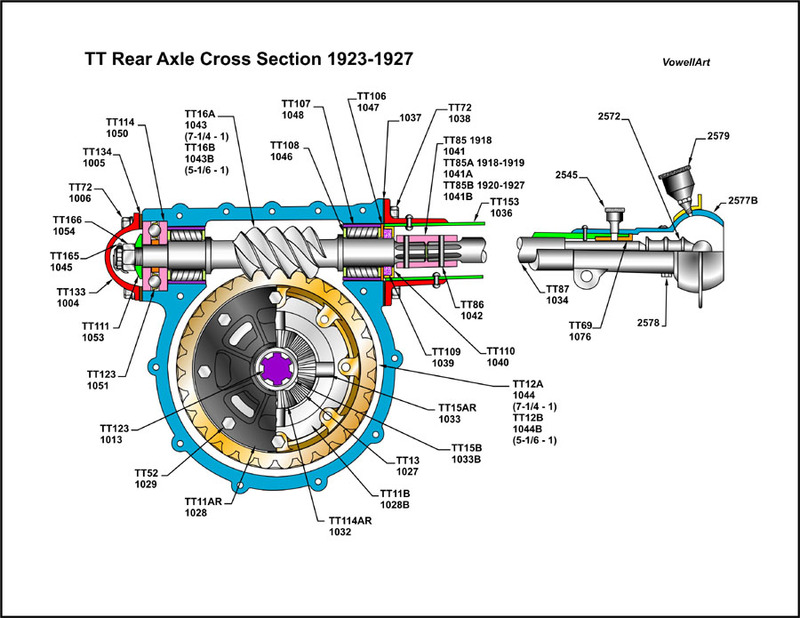 What I find to be really interesting about this axle, is that it is basically the same as the one on the Fordson Tractor. The only difference that I can see is where the worm comes off the ring gear...on the TT it is on top, on the Fordson it comes off the bottom...I suppose that's for torque , better pushing from the bottom of the axle, whereas from the top would be pulling. Anyway, this is the later model of the TT, with the 4 pinion gears on the spider. The early truck had only 2 pinion gears and I'm still trying to figure that one out, as to how that worked precisely. I don't have any Ford drawings for TT, only a lot of photo's from you guys, although I've never seen one with the 2 pinion gears, would like to know if anybody has one of these axles and has some pictures of what it looks like with the differential cover removed. There are a lot of parts that aren't shown on this drawing, because it is a cross section (housing gaskets, differential lock, axle end spacer, backing plates, etc. )...on the isometric drawing those parts will show and where they go in the assembly. I included the Ford Factory Numbers where I knew them, the other numbers are Vendor Numbers and the ones on the driveshaft end are from the car (don't know if they are different or not, couldn't find any reference to them other than the driveshaft/torque tube was one assembly). As always, if you guys know something I may have missed or if I've got something wrong, please let me know, thanks. Martin, thanks for sharing. Is the inside diameter of the driveshaft tube (green part) stepped at the differential joint end as shown? The clearance between the inside of the tube and the shaft appears 'tight' at the step. I may have falsely assumed the bore was reamed for the brass bushing and then the tube diameter increased from there to differential end of the tube? Does grease cup 2579 thread thru the ball cap retainer and into the driveshaft tube ball? Excellent detail on the differential end of the d/s showing spline connector, are there pins holding the connector and shafts together? Martin, With the worm on the bottom it is in a bath of oil all the time. And the center of gravity will be lower with the motor sitting lower in the frame. I dont see any difference with the push or pull power. 2 pinions work the same except they work harder then 4. I've been wondering if you'd tackle this! Very cool and thank you! The drive shaft tube is 3" diameter (OD) compared to about 2-3/16 (OD) on the car (after the taper) and the flange isn't another part. It's formed from the tubing. ? I sure do like the size difference comparing the front of the tube to the rear. I've never even had one apart yet so maybe I should keep quiet but I like to help. James, as far as I can tell the torque tube is tapered. There are no details on that assembly so I don't know really whether it is stepped or tapered, but the parts catalog that Bruce published shows them all as being tapered. You're right it does appear "tight" where it comes to the end, I'll look into that and see if I can find an example among my photos. As for the "Dope Cup" 2579 I don't think it does, at least it doesn't on my car, but then that's a car not a truck, there should be a rather largish hole in the ball end though (that I seemed to have forgotten to put in). Now as for the other end, that's all I could figure out how it went together...the end of both the output shaft and the driveshaft are splined, yet neither is hollow on one end. That coupler seems to have matching splines on the inside and it seems reasonable that it fits over both of them. 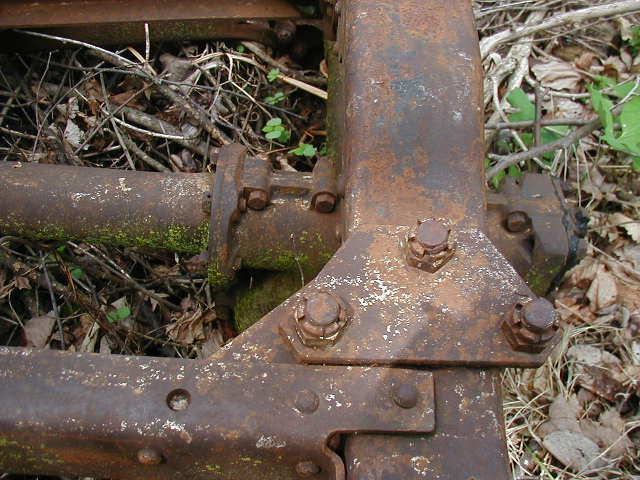 I did find reference to a coupler though and when you look at the pictures in the parts book, it appears to have two holes spaced about 1.5 inches apart TT1041, the next part on the list is the coupler pin TT1042, so I assumed these two pins hold the two shafts together by that coupler. As far as I know the ball end of the driveshaft is exactly the same as with the cars (that's why the torque tube tapers or steps down to that particular size) so it can fit up the engines 4th main. As far as I know the engine is exactly the one used in a car as are the front wheels basically everything else with the exception of the front axle, that is a bit different, that I think is a bit beefier (not sure though). The frame is really different also. I'm thinking of doing a longitudinal cross section showing the axle shaft plain. 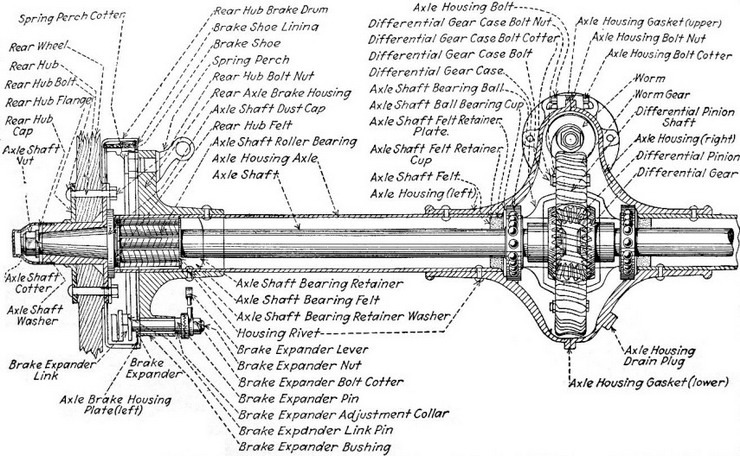 That drawing should show more of the differential and the bearings than appear in this one. The other thing I'm not certain of though, is the "U" joint the same one used on a car? I would think that the knuckle should be a bit bigger, but there is no reference to it in the parts book, so maybe it's really just a car "U" joint. Scott, I've thought about the bottom version of the drive out put shaft, you're right it would be running in oil, more so than from the top. And it does lower the center of gravity placing everything lower, placing those large steel wheels on the back would make for better ground clearance, making the tractor seem "higher" but it seems to me that it would also affect the output. Ford could've compensated for the top output for the tractors, but instead he turns the housing upside down and makes it come off the bottom...there has to be some reason for that...I would think. But I don't know much about Fordson's either, other than this seemingly similar output in two different placements. The 2 pinion gear assembly I have no idea how that worked at all, I've no pictures of that assembly, nor do I have any Ford drawings of one either. 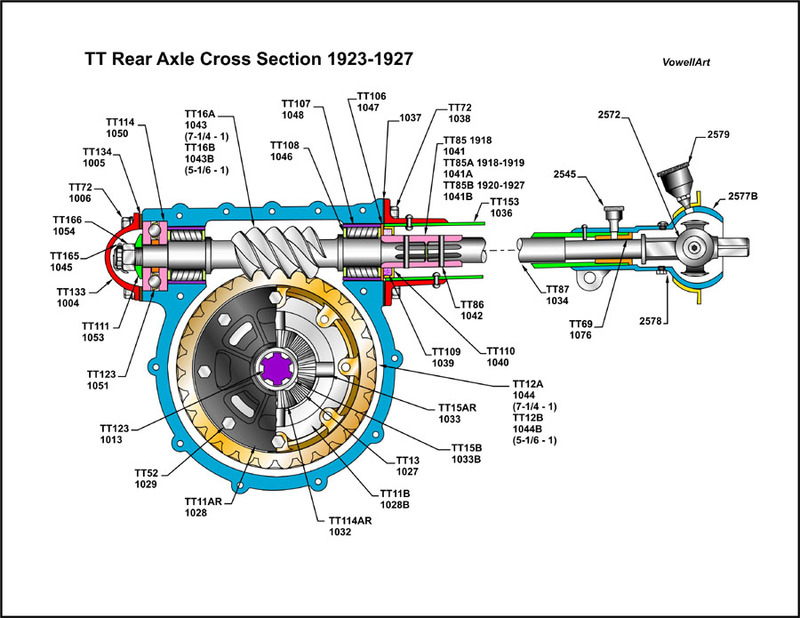 I've found reference to it in the parts book though and seen what the pinion shaft looks like, but there is no collar or shaft on it to fit over or in anything on the differential. So, how it actually works, I haven't the foggiest. The one thing I do know from looking at the parts book...the early TT's (1918-1922) all had one piece torgue tubes...the later versions had on the output side of the tube a flange (like I show) riveted to the tube. But they don't call out this flange other than as a completed assembly of the driveshaft. Duey, I figure that the reduction is because the ball end of the driveshaft has to fit into the engine's 4th main. And since the engine is the same as the cars, that means the torgue tube has to reduce to that size either though taper (like on the early ones) or a step down of the tube...but it must absolutely mate up with the 4th main of the engine somehow. Quite a while ago (1980) I had the opportunity to buy a TT for $300.00 from a friend who wanted to be rid of it for what he paid for it. At that time I couldn't see any practical value of being a big slower thing on the road besides a Model T, so I passed on it...now I wish I had bought it, if for no other reason other than to study this particular drive train. Looks mighty good to me Martynn, going from memory. I had the early 2 pinion, but sorry - don't think I have any pic's of it. Also I have a good image of a tt rear drawing - very detailed, I think - well try to post it. Your drawing are very impressive. Martin: Regarding the Fordson tractor; back in the mid 1970's in Lemoore Ca. I got to talk to a neighbor who farmed with a Fordson in the 1920's. He said that the Fordson was better than the mule team, but the worm and crown gear set would not last one farming year. He said it was common to start the year with a new set and then have to change it out at mid year to make sure they wouldn't fail at harvest. The other thing that he said was that sitting a few inches above the worm housing was very hot. My guess is that Ford put the Fordson worm on the bottom and in the oil to keep it cooler and that also kept it away from the driver a little more. Hmm, does the coupling extend back beyond, so that the felt seal rides on it, instead of the out put shaft? Seems rather plain that the axle shafts are also splined, hmm, I think I got that backwards then...I thought that the output from the differential was splined not the axles. OK, got some ideas on what to change, thanks. My TT has a 2 pinion rear end. I've had it apart and I believe Scott is right. It just works harder because there are only 2 pinion gears instead of 4. I'm pretty sure the only parts that differ between the 2 pinion and the 4 pinion are the gear case (1028 vs. 1028B) and the differential pinion shaft/spider (1033 vs. 1033B). I believe the pinion gears are even the same, just the quantity varies (2 vs. 4). Everything else, as far as I can remember, is interchangeable.